Stops Acne break outs– If you are tired of the problem of acnes continuously breaking out on your face and looking for an effective natural cure for the same, Lavender essential oil can be the right medicine for you. It has anti-bacterial properties which curbs growth of micro-organisms which are responsible for acne breakouts. Reduces swelling and skin inflammation – Lavender essential oil is one of those few products which are loaded with anti-inflammatory properties. Thus, it is considered a very impactful remedy to cure inflammations and swellings in skin tissues. Remedy for First stage burn – According to a few experts, it was lavender oil’s great ability to treat burns which triggered birth of aroma therapy. Lavender has awesome qualities to offer instant relief in burns and it heals the wound faster than every other remedy. It is considered that lavender has those medicinal properties which catalyze cell formation in skin. Thus, it helps in healing burn wounds faster. Removes Body Scars -Lavender oil’s qualities to boost skin-cell formation bring another benefit to you. This property helps the oil in faster removal of burn scars too. So, if you do not want to live with scary memories of burns and want to get rid of scars, include lavender essential oil in your beauty enhancement kitty. Helps To Cure Fungal Infections – Lavender Essential Oil’s anti-bacterial and anti-fungal properties halt the growth of dangerous micro-organisms. This helps in treatment of several fungi caused disease such as ringworm, itching etc. To get maximum relief, it is suggested to use this essential oil with an alcoholic solution. If lavender essential oil is not available, you can go for cream or lotions which primarily contain extracts of lavender flowers. For Smoothening of Dry Skin – Summer is on its way back and winter is on the threshold. It’ll soon knock your door. Though, it is a great season to hang around with friends and have fun in sun but winter has its own cons too. And, one of the worst negative features of winter is stealing of body-moisture. All of us put extra effort to keep skin moist and chap-free in the colder season but our efforts go in vain. This time, you can keep your skin smooth and silky with help of lavender essential oil. This oil has abilities to instantly moisturize your body and its effect stays for long. Cures Chapped Lips – Chapped lip is another skin woe in winters. Lavender essential oil is a cure for this too. Take a few drops of the oil and rub it on your lips immediately before your bed time. Next morning, you’ll find your rosy smile back. Offers relief in bee sting and insect bite – It is truly tough to bear the tingling and sensation caused by bee sting and insect bites. People look for every cure which can offer an immediate relief in such painful situations. You can use lavender essential oil to make the sting effect reduced. Its anti-inflammatory properties also help in reducing swelling caused by such stings and bites. 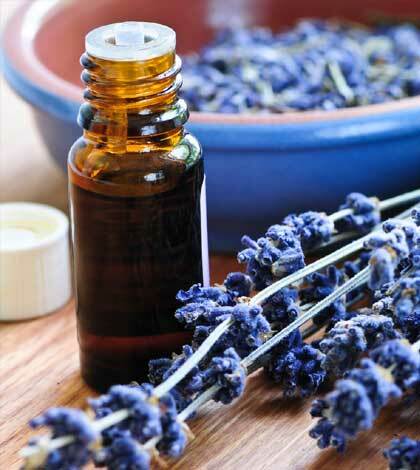 A natural antiseptic – Lavender essential oil is also regarded for its antiseptic nature. You can directly apply this oil on a fresh wound or cut. Just clean the affected area and put some drops of lavender oil on that. It’ll help to heal the wound as well as remove the cut marks too. Add a few drops of the oil in your bath water. It’ll confer you with a brand new refreshment and glowing skin.